This is one of the most touching stories from the life of Jesus. Cana is a little village situated a few kilometers north of Nazareth, populated by peasants and craftsmen; poor, simple and generous people. Today is a feast day marking a marriage (John Chap.2). In those days a wedding was a great celebration. There were many guests; they danced, sang, laughed and made music in this very important event uniting two lives. The days were gone when one 'bought' a wife for a suitable dowry. As long as the man was of the same religion, respected the Law of Moses, was strong and a good worker, he was welcome into the larger family. Although it is known that Simon the Canaanite was one of Christ's cousins the exact identity of the newly weds or their relationship to Jesus will probably never be known. - The village folk, the neighbors, the chief priests from the synagogue, the relations from both families as well as Mary of Nazareth, Jesus of Capernaum and all his disciples together with many others, including strangers, all of whom were happy to share this open-air feast spread in the shade of the green trees of Galilee. Suddenly in the middle of the meal there was an uneasy moment. The servants who had been hired for the occasion were whispering together and one of them spoke to the master of the house who suddenly looked worried and very embarrassed. Mary who had noticed that something serious had happened asked one of the servants what was the matter. 'There is no more wine,' he replied. Mary instantly foresaw the embarrassing consequences this unfortunate incident. She could imagine the joy of the villagers suddenly dissipating when the embarrassing fact was announced that there was no more wine and that everyone could now go home. But Mary, who knew the newly weds well, did not want this, the happiest day of their lives, to become for them a sad memory. "they have no more wine!" 'Woman my hour has not yet come'. For a moment Jesus was uncertain what he should do. We are often faced with delicate situations in life and would prefer not to intervene, but is not our whole life in the hands of destiny whose trials test our courage? But Mary insisted and after a while he gave in to his mother's request. This is not a unique event for millions of times Mary, the mother of Jesus, has heard the prayers of those who were in dramatic and sometimes hopeless situations, and she has intervened to save her children. 'Do as he tells you'. 'Fill those jars with water'. And they filled them without questioning. or finally the prodigious fact that 300 liters of water had been changed into an excellent wine. Many wine connoisseurs had been surprised to find a wine of such high quality in this small Galilean village. John stated that after the wedding Jesus went down with his mother, his brothers and cousins, as well as his disciples to Capernaum, the lakeside town where they stayed for a few days. Jesus often went up to Jerusalem in Judea to celebrate with his Jerusalem family the main Jewish ritual feast which marks the flight from Egypt but this is the first time he enters his Father's House with all his disciples. Easter (Pessah) is the principal Jewish ritual of the year when the Diaspora (the Jews dispersed all over the world) arrived like a flood tide into the holy city of Jerusalem reaching the very steps of the great temple. The priests and the slaughterers know it well and, with an eye to the good business ahead, gather together large numbers of livestock from bulls to deer, and lambs to little doves, all of which await the buyers in an atmosphere of fairground and cattle market combined. When Jesus arrives at the temple in Jerusalem with his disciples he has difficulty entering the courtyard which is as full of animals as the approaches to a slaughterhouse. He knows those hard-hearted merchants, and those money lenders who apply excessive rates on the resale of the livestock and who cheat on the exchange in their dealings with the pilgrims come from all over the world to celebrate Easter in Jerusalem. At the sight of these practices he is beside himself and HE, who was called a meek and gentle, goes into a holy rage. He seizes a whip, chases away the animals and Bedlam ensues amid their cries. The money lenders' tables are upset and some of them grovel on the floor in an attempt to rescue their coins whilst onlookers take advantage of the commotion to disappear into the dense crowd their pockets full. 'Destroy this temple' pointing to his breast 'and in three days I will raise it up'. The Jews, who thought he was speaking of the demolition and reconstruction of their great temple had obviously not understood that he was speaking of the temple of his body. 'This temple took forty-six years to build, and you are going to raise it up in three days'? During his public ministry Jesus performed thousands of healings since everywhere he went all the sick were gathered in the public place and were healed just by being where his shadow passed. The scriptures describe only twenty-three healings which were chosen to illustrate a specific teaching such as the six spectacular healing miracles which Jesus performed on a SABBATH. Jesus obviously wanted to correct some deficiencies in the application of Jewish Law and customs, and it is therefore not by chance that Jesus chose precisely six Sabbath days to heal and thus teach a lesson to the bigoted orthodox Jews. This alienated the scribes, the doctors of the Law and above all The Pharisees who gave more weight to the letter than to the spirit of the Law. The Sabbath is the DAY OF THE LORD, and the main Judaic precept governing this day is complete and absolute rest, where even the least form of work is absolutely forbidden. Nevertheless it was permitted under the Law of Moses to enter a vineyard and eat grapes at will, but not to fill a vase; it was also allowed to enter a field of ripe wheat to gather the ears by hand, but not to reap with a sickle. Luke 6: Healing in a synagogue of a man with a withered hand. Luke 14. Healing on the Sabbath of a man suffering from dropsy. John 5, v 2 . In Jerusalem near the Sheep Gate there is a pool named Bethesda surrounded by five colonnades. Under these colonnades many sick people wait for an angel to descend from time to time from heaven to stir the water. The first man to enter the water after the angel's bath is cured, whatever his disease. The evangelist finds nothing strange about this. An angel bathes now and again and a sick person is healed when he leaves the water. God's chosen people are really very spoiled considering miracles are part of everyday life. Jesus passes this way and notices a man who has been paralysed for thirty-eight years. The passing of the angel is his last hope. he wants to be healed? 'Pick up your mat and walk'. The man obeys, gets up, picks up his mat and walks. Then the Jews told the man he was not allowed to carry his bed on a Sabbath. Later the man saw Jesus in the temple and recognized the man who had healed him and Jesus invited him to change his lifestyle. The one-time paralytic went and told the Jews about Jesus, the benefactor who had healed him on a Sabbath. At first sight one may wonder what was the point of the disciples' question, which will remain forever unanswered. Has this man been condemned to be born blind because of sins committed in a previous life, or is his parents' behavior the reason for him coming into this world with this infirmity? How one wishes the Master had replied more clearly to his disciples' question. 'This man cannot be from God because he does not keep the Sabbath'. 'How can a sinner perform miracles? As far as I am concerned he is a prophet'. What strange a views were held in those days of the origin of infirmities. Perhaps this was what led the disciples to ask Jesus that first question to which he did not give a clear reply. 'You have seen him' Jesus replied. I do believe Lord' he said, and bowed down to worship him. John, who mentioned but few of the miracles performed by Jesus, never forgot this testimony. Carl Sagan said: 'Man is but stardust. He is a product of the cosmos, of the interstellar universe, but he is made up of elements which have been transmitted since the dawn of time. Sagan defines the cosmos - within the boundaries of the Cosmic Ocean, as an immense void, as an eternal night without warmth and spirals of light: the GALAXIES. Each galaxy is an autonomous UNIVERSE composed of a myriad of stars synchronized by and moving invisibly in a vast movement around their central axes. We call our galaxy the Milky Way. 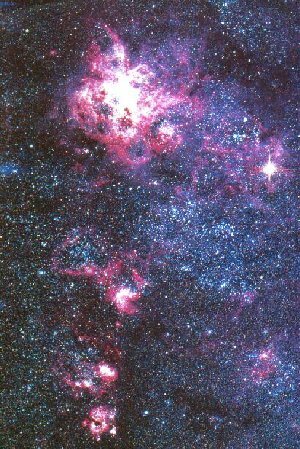 It is composed of about four hundred billion stars, and it takes no less than two hundred million years at a speed of 200 kilometers per second to complete one circuit. Each of these stars is a distinct solar system, comparable to our sun, which gives us light and warmth, the two elements essential to life on our planet EARTH. Man, that perambulating mass of dust, dreams of one day conquering the cosmos and populating other worlds, and other planets where life in this great universe would be possible. However, at present he cannot even envisage a journey to the nearest star, Proxima Centauri, which is only four light years distant. It would in fact take him 120.000 years to get there in a spaceship travelling at 40.000 kilometers an hour. 'I did indeed come from the Father; I came into this world.' (John16, v 28). 'Do you not believe that I am in the Father and the Father is in me?'. 'It is the Father who lives in me accomplishing his works'. (John 14, v 28). 'I am the way, the truth, and the life; no one comes to the Father but through me' (John 14, v 6). Meditation on this very profound text reveals that the Father and the Son are closely linked (rather like the Vishnu who, in the Hindu religion, can take on several forms) to the point that the Father can be divided and remain in another form. Extract from Saint-Exupery's book "The Little Prince "
'The little Prince had just left his star, and during his voyage through the vast universe met, on one of the planets, a very strange person, a businessman who, sitting behind a desk, was so busy that he did not even raise his head when the little Prince entered. - 'Good morning' said the little Prince 'your cigar has gone out'. - '500 million what?' repeated the little Prince more loudly. He had never given up on a question once it was asked. The businessman, realizing that he was to have no peace, tried to explain briefly. - 'Millions of those little things which shine in the sky' 'Fireflies?' asked the child. 'No, those little golden things that make idlers dream. But I am serious, I don't have time to dream. - 'YES, that is all' affirmed the businessman. The little Prince went on his way very perplexed. His ideas of serious matters were very different from those of adults. How many people pile up bits of paper bearing thousands of zeros instead of using them to rescue from misery, hunger and suffering so many people on this earth? Mark 4, v 21. 'Is a lamp acquired to be put under a bushel basket, or hidden under a bed? Is it not meant to be put on a stand? In Chapters 4 and 5 of his letter to the Ephesians Paul exhorted them to walk as the children of light, for the fruit of 'light' produces all sorts of goodness, justice and truth'. 'Take no part in vain deeds done in darkness; rather condemn them. It is shameful even to mention the things these people do in secret, but when such deeds are condemned they are seen in the light of day and all that then appears is light'. That is why it is written 'Awake O sleeper, arise from the dead and Christ will give you light'. John 1, 'God is light and there is no darkness in him.' If we walk in the light we are in communion with him and the blood of Jesus cleanses us of all sin. Psalm 27. 'The Lord is my light and my salvation; whom should I fear? Zechariah 14, v 7. In that day there shall be one continuous day, known to the Lord, not day and night, for in the evening time there shall be light.On that day living waters shall flow from Jerusalem'. A tiny " little light "
What is the matter this evening? A little of its warmth. And look towards the sun calling you to travel. Try at least to smile. For the eyes of some doe you will change your destiny. And you will find the strength that solves problems. Where love alone is Law. To see that life is good. The night is ablaze with brilliant diamonds. Always take the time to say a prayer. Ezekiel 47, v 6. 'Have you seen this, son of man? John 4, v 7. Jesus asked a Samaritan woman 'Give me a drink' and the Samaritan woman answered 'You are a Jew. How can you ask me, a Samaritan and a woman for a drink? Jesus replied 'If only you rec recognized God's gift, and who it is that is asking you for a drink, you would have asked him instead, and he would have given you living water'. - 'Sir' she challenged him, 'you do not have a bucket and this well is deep. Where do you expect to get this flowing water? Surely you do not pretend to be greater than our ancestor Jacob, who gave us this well? John 7... 'If anyone thirst, let him come to me; let him drink who believes in me. 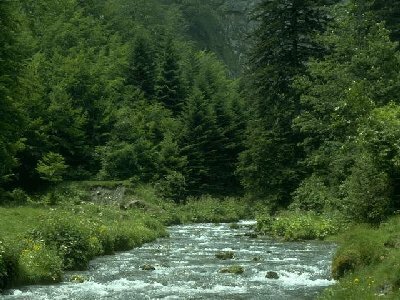 Psalm 42, 'As the hind longs for the running waters, so my soul longs for you O God'. that remains unto life eternal, food which the Son of Man will give you. does this shake your faith? Here Jesus clearly places the boundary between temporal matter and eternal spirit. Jesus compares his body to a bread which satisfied eternally. His DOCTRINE and HIS words become nourishment for human kind. He who nourishes his soul with this doctrine will live forever. 'Doing the will of him who sent me and bringing his work to completion is my food'. This is confirmed by the Apostle Paul in his letter to the Romans, Chap. 14: 'The kingdom of God is not a matter of eating or drinking but of justice, peace, and the joy that is given by the Holy Spirit'. This is why at the Last Supper, during the last Easter feast, Jesus took the bread, (Mark 14 and Matt. 26) blessed and broke it, and gave it to them. 'All of you must drink from it for this is my blood, the blood of the covenant to be poured out for the remission of sins'. A. The parable of the seed. (Matthew 13, Luke 8, Mark 4). on good soil where the seeds yielded grain abundantly. Explanation: The farmer is God, the seed if God's word and the good earth is the receptive souls who listen to the word of God and put it into practice. But, as Saint Paul in his second letter to the Corinthians, Chap. 3, v 6. 'Christ has made us qualified ministers of a new covenant, a covenant not of a written law but of spirit. The written law kills, but the Spirit gives life'. Why do we call our planet Earth? It could have been called sea (there are more oceans than continents) or sandy desert, or rocky mountain, or star for we are in fact on a piece of cooled off star the core of which is still in fusion. The term EARTH allows for the creation and development of life. Just as dust is dried out earth, good earth contains nourishment for plants, animals and man. Our planet is a place unique in our solar system which favors living things, protects their evolution and sees to its proliferation from generation to generation. This protection is a permanent miracle which must reflect our will to protect life and non to let it die, slowly, in the search for immediate profit. By exterminating the animals, cutting down the trees, emptying the depths of the seas and polluting our Atmosphere we are demolishing the stuff of life itself and suffocating future generations. unless the grain of wheat falls to the earth and dies it remains just a grain of wheat. But if it dies it produces much fruit. The man who loves his life loses it' and he who gives it, or dominates it in favor of his spirit will 'preserve it to life eternal'. LIFE: An invisible electric charge which keeps our atoms in place in order to give the appearance of solidity and unity to matter. A current which animates protons and neutrons, whilst eliminating the noxious gases and exploiting the good ones. MAN: A thousand billion cells which move with each individual. A brain which never ceases to develop. A genetic code which transmits, creates, controls, selects and evolves. This incredible latent stamina may allow cells to fall asleep in absolute zero and to travel through the great interstellar universe with the aim of one day waking up in contact with water and the warmth of another sun and, independent of time and distance, start a new life cycle on a new planet. But man does not own the Earth, he is a tenant, a passing stranger, a ephemeral adventurer with no future but to become fragile with the passing years and, one day, becomes dust; and whose life is but a spark in comparison with cosmic eternity. MAN is a 'grain' which must die and, if he so deserves, live again elsewhere. We are like the caterpillar which crawls on leaves in order to find nourishment for survival. It is ugly with its weird shapes, covered in warts and spikes and halts in fear taking on the color of the bark on which it stands in order to blend with the elements which surround it. One day, when it is large enough it will, with the aid of its special glands, develop a silk cocoon in which it will enclose itself and hibernate. Then, comes the surprise, when one fine morning a multicolored butterfly flies off into the sky leaving its chrysalis to dry and rot on the deserted branch.